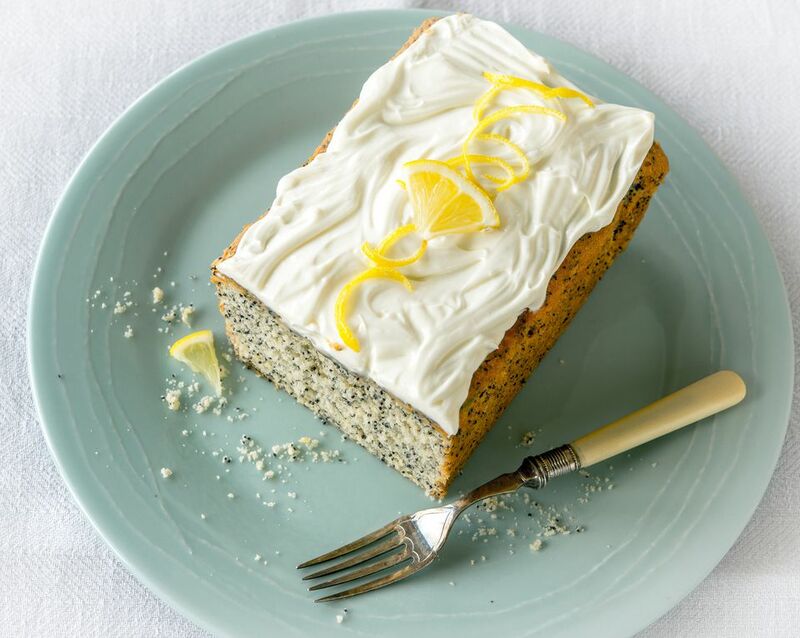 When tea time strikes (or anytime you fancy something sweet for that matter), what better way to sit down than with a delicious lemon and poppy seed cake to accompany your cup of tea. The tangy, lemony cake fills any gap nicely. Even better, the cake is super easy to make. Topped off with a cream cheese topping adds yet another layer of deliciousness. Preheat oven to 300 F. Lightly grease a 7 x 5 x 3 1/2-inch loaf pan and line with parchment paper. Place the butter in the bowl of a stand mixer and beat on a low speed, until light and fluffy. Add the sugar, a few tablespoons at a time, and continue to whisk on a medium-low speed, until the mixture is almost white. (Note: If you whisk on a high speed, the mixture will start to melt.) Add the lemon zest and mix quickly for a few turns to incorporate. Lightly beat the eggs with a fork, then, with the mixer running, add the egg a little at a time. Do not rush this process or the cake batter may curdle. If it should, then add a tablespoon of flour to the mixture and whisk, it will come back together. Remove the whisk from the bowl, sift in the remaining flour and add the poppy seeds and yogurt. Carefully fold these together with a spatula, taking care not to knock too much air from the mixture. Spoon the cake batter into the loaf pan. Once the cake is finished, remove from the oven and leave the cake to cool in the tin for 30 minutes. Then remove from the tin and cool completely on a wire rack. Meanwhile, prepare the frosting by beating together all the frosting ingredients in a bowl until thick and fluffy. Once the cake has cooled completely, then spread the frosting on the top using a palette knife or fork. Let your imagination roll on the decorations with tiny slices of lemons, curls of lemon zest, or just keep it simple and let the frosting speak for itself. Test to see if the cake is ready by inserting a skewer into the cake. It should come out clean. If not, cook a little longer. The poppy seed cake can be made well in advance, as this already versatile cake freezes so well. Just wrap in parchment paper, then in plastic wrap, and it will keep well for up to a month. Just defrost before eating. The addition of lemon is what makes this cake sing; however, should you want to ring the changes from time to time, switch out with orange or even a mix of lemon and lime. They will all taste amazing!